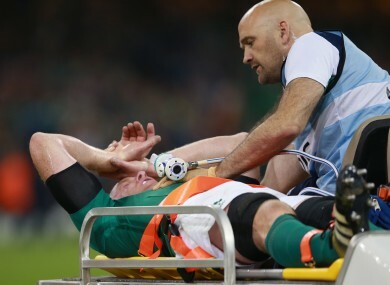 Paul O'Connell's World Cup ends on a stretcher. THE SOUTH AFRICAN referee became Scotland’s most-hated man in 2015. In the Rugby World Cup quarter-final between Australia and Scotland, Joubert incorrectly awarded Australia a last-minute penalty that knocked a brave Scotland side out of the tournament. Joubert, then swiftly ran off the pitch at the final whistle to avoid confronting the enraged Scottish team. McClaren was sacked by Derby County in May after winning only two out of their last 13 league games. This disastrous run of form saw the Rams finish outside the play-off places, despite leading the Championship in February. In spite of this failure, the former England manager, would go on to sign a three-year contract with Newcastle United in the summer. However, McClaren’s fortunes haven’t improved. Newcastle currently sit second from bottom, after winning only two of his first 14 league matches. Burgess, who switched codes from rugby league to union in 2014, was a controversial pick in England’s Rugby World Cup squad. He probably wishes he hadn’t bothered now. The tournament was a disaster for him personally, and England as a whole, after they crashed out of their own World Cup in the pool stages. Having been dropped to the bench for the vital match against Australia, Burgess was then dropped from the panel for the final game against Uruguay. After much speculation, Burgess switched back to rugby league to join his former club South Sydney Rabbitohs in November. Possibly Irish football’s most naturally gifted footballer, Aiden McGeady, had a year to forget. Not that much happened. After escaping the Arctic conditions in Moscow two years ago, McGeady has found himself frozen out of the Everton squad this year, having featured in only four Premier League fixtures so far this year. Having found his playing time limited at Goodison Park, McGeady has lost his place in the Irish side, despite being a firm favourite with his former Celtic manager, Martin O’Neill. McGeady needs to seek a move, either temporarily or permanently to ensure he is on the plane to France. The Cork legend resigned as Cork’s hurling manager after losing to Galway in the All-Ireland quarter-final. After winning six All-Ireland medals as a player, Barry-Murphy was unable to replicate his success in 1999. A well-loved and much respect figure in GAA, the Cork story didn’t finish the way he wished or deserved. O’Dowd’s side became the first Meath team to lose to rivals Westmeath in a Championship match, despite being eight points ahead at half-time. Meath wilted in spectacular fashion in the second half and ended up losing the Leinster Championship match by four points. Tyrone would go on to knock Mick O’Dowd’s men out of The Championship in the qualifiers. Turan, who joined Barcelona from Atletico Madrid for a fee of approximately £29m in the summer, has yet to kick a ball for his new side. The 28-year-old will not be able to play until 2016, after Catalan club were banned from registering new players until the new year. Having scored 22 goals and provided 32 assists in four seasons with Atletico Madrid, his addition will only increase the attacking potency of the Barca attack. His first game for his new club could be against city rivals Espanyol on the 3rd of January. 2105 was a year to forget for Sepp Blatter, not that 2016 is looking any better. He announced he was stepping down as the head of the FIFA in June, just days after being re-elected, amidst claims of corruption within the organisation. He is currently serving a FIFA suspension and awaits investigations by both the Swiss attorney-general and the FIFA ethics committee, the devil’s fire could get a lot hotter in 2016. “I’m extremely gutted, disappointed really. The mind boggles, really.” were the words used by Anthony Cunningham as he announced his resignation as Galway hurling manager. Despite guiding the tribesman to this year’s All-Ireland hurling final, player power forced Cunningham’s hand, after a failed mediation process between himself and the players. It was later revealed that 26 members of the current panel voted against the manager staying on for another season. A “heartbreaking” end to a successful season for Galway. This wasn’t how it was meant to end for Paul O’Connell. One of Ireland’s bravest ever sportsman’s last act, was being stretchered off against France in the Rugby World Cup. No doubt, O’Connell would have dreamt of lifting the Webb Ellis Cup for Ireland, or at least finally getting past the quarter-finals but the sight of him being stretchered off against France will stay with every Irish person who watched it. Email “10 sportspeople who cannot wait for 2015 to end”. Feedback on “10 sportspeople who cannot wait for 2015 to end”.